If you're a vegan, a vegetarian who avoids some animal products, lactose-intolerant, or an omnivore who likes to try foods from many cultures, you've likely come across coconut milk as a dairy milk substitute. However, pure coconut milk is very high in calories and fat, with an especially high number of saturated fat grams, which may make you wonder just how healthy this beverage really is. 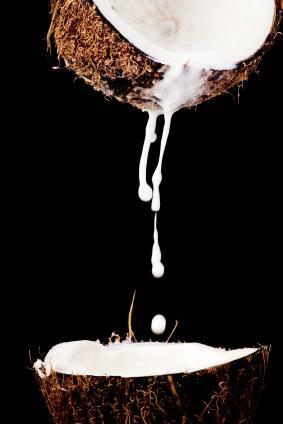 In addition to being a creamy, delicious alternative to dairy products in cooking, baking, and drinking, coconut milk does have some health benefits as well. People who need to stay away from dairy and soy because of allergies and sensitivies often find that they can digest coconut milk without problem. The thick, creamy texture of coconut milk makes it an ideal choice for dairy- and soy-sensitive people to use when baking or in place of nut or grain-based milks. It's true that coconut milk contains a lot of saturated fat, but the fat in coconut oil - where the fat in coconut milk comes from - is slightly different than saturated fats that come from animals. These plant-based fats are medium chain fatty acids, which don't degrade in the body the way animal fats do. Instead of adversly affecting cholesterol levels, they may actually lead to an increase of HDL - or good - cholesterol levels. Like coconut oil, coconut milk contains large quantities of lauric acid, which your body converts to monolaurin, a chemical which your body uses to help fight off viruses. Lauric acid may also work as an anti-bacterial agent, helping your body fight off unwanted bacteria, such as staph. While there is some evidence to show that coconut milk can have a positive effect on your health, it isn't without health risks. Consider the following when incorporating coconut milk into your diet. Undiluted coconut milk is extremely high in calories. A one cup serving contains more than 550 calories, which can make up about a third of the calories you need in a day. Including coconut milk on a daily basis, while not cutting down on other calories, may have a negative impact on your weight. The vast majority of the calories in coconut milk comes from the amount of fat. A one cup serving of coconut milk contains more than 40 grams of fat, most of them saturated. Additionally, it's importat to remember that while these plant-based fats may raise your HDL, they can also raise your LDL, or bad cholesterol, as well. Watch your total number of daily calories. Balance your consumption of coconut milk with other milks (dairy or non-dairy), whole grains, and other whole foods. Dilute the coconut milk with water to help cut the calories and fat grams. Consume "light" versions of coconut milk and unsweetened coconut milk "drink", which may have as few as 70 calories per serving. As with many things in life, moderation is the key to including coconut milk as part of a healthy diet. If you enjoy it as a delicous dairy and soy alternative from time to time, you shouldn't have any worries about its impact on your health.